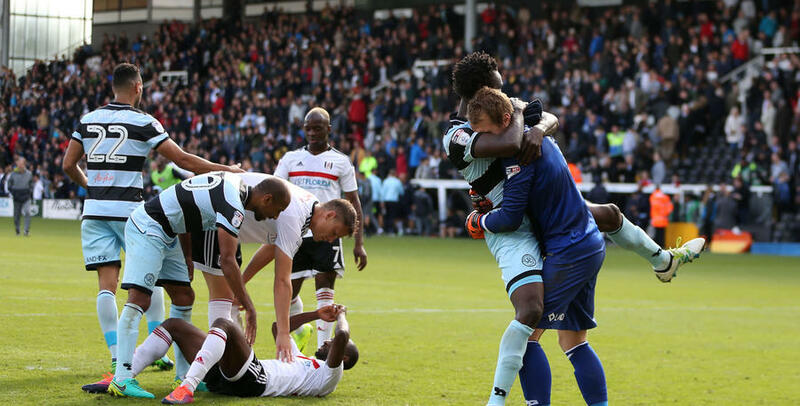 QPR recorded their first win at Craven Cottage for 36 years with a 2-1 victory over Fulham thanks to a later Idrissa Sylla goal on an incredible afternoon. The R’s took the lead in the 20th minute through Conor Washington, having earlier seen Alex Smithies save a Tom Cairney penalty. The hosts levelled through Tom Read in the 47th minute before Sylla headed home what proved to be the winner three minutes from time. But the action didn’t end there, as the hosts were awarded their second spot-kick of the afternoon in the 95th minute, but Sone Aluko’s effort crashed off the post to the delight – and relief – of the travelling QPR faithful. Jimmy Floyd Hasselbaink made two changes from the side that drew at Burton Albion on Tuesday evening, with Joel Lynch coming in for Jake Bidwell and Sebastian Polter in for Ariel Borysiuk. It meant the R’s lined up for this derby fixture with Alex Smithies between the sticks behind a back four of, from left to right, Lynch, Grant Hall, Steven Caulker and Nedum Onuoha. Massimo Luongo and Karl Henry lined up in the middle of the park, with Pawel Wszolek and Conor Washington taking up advanced wide positions. Tjaronn Chery started just off Polter in attack. Despite recent results against Fulham, the R’s supporters travelled in their numbers to Craven Cottage and were very vocal in their backing as the two teams emerged onto the pitch. And within 18 seconds QPR had their first effort on target. Wszolek was released down the right by Chery, and the Polish winger stood a great ball up to the far post, which Washington headed goalwards, but his effort was easily gathered by David Button in the Fulham goal. 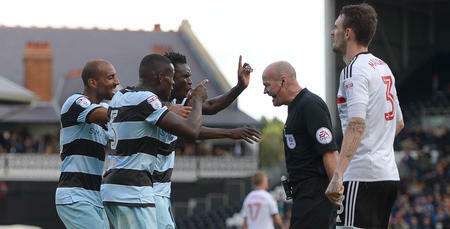 But in the fifth minute Fulham were awarded a spotkick when Caulker was adjudged to have held in the box from a Whites corner. Tom Cairney stepped up to take it but was denied by a stunning Smithies save, as the R’s stopper dived full stretch to his right to deny the in-form Fulham man. Chery had two efforts on goal saved by Button as Rangers looked to use the penalty save as a fillip. On 16 minutes, Cairney found Scott Malone in space inside the R’s area, but his low drive was well saved by Smithies. Four minutes later Rangers broke the deadlock through Washington, with the R’s forward grabbing his first league goal for the club. Wszolek played the ball square on the edge of the area and the QPR number nine tucked the ball into the bottom corner, to the absolute delight of his team-mates and the travelling QPR fans. The hosts almost grabbed an immediate leveller through Denis Odoi’s header but it flashed over the bar, while the Whites had an incredible chance to equalise when Lucas Piazon unselfishly squared for Chris Martin to slot the ball into an empty net, but the former Derby man put the ball wide. 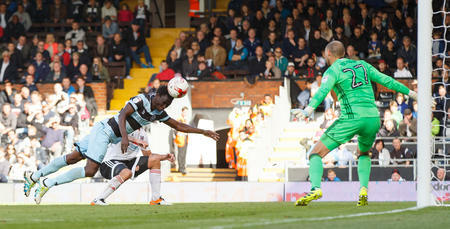 Fulham enjoyed a sustained period of pressure, as the R’s team worked hard to contain them. Hasselbaink’s side managed to fend off a series of Fulham corners, while the QPR fans gave the players plenty of vocal support from behind Smithies’ goal. QPR were nearly caught out on the counterattack, when Sone Aluko broke at pace down the right, but his curling effort went just wide of Smithies’ far post. And in the 37th minute, Scott Parker flashed a shot inches wide. The R’s worked hard to contain Fulham and will certainly have been pleased to go in at the break a goal to the good. But the hosts didn’t have to wait too long after the restart to level. In the 47th minute, Parker’s far post effort was palmed away by Smithies but straight into the path of Tim Ream who smashed the equaliser home from ten yards. Both sides were certainly looking to win the game, and it was Fulham who again went close in the 55th minute, this time Ryan Tunnicliffe’s low drive going just wide following good work down the right by Cairney. Caulker then had to produce a last-ditch goal-line clearance a minute later to deny Parker, who had beaten Smithies with his edge-of-the-box effort. Hasselbaink brought on Idrissa Sylla with just over half an hour remaining for Polter, and the Guinean striker saw his effort on 62 minutes comfortably saved by Button following hard work down the left by Washington. Olamide Shodipo was introduced to the action at the expense of Wszolek shortly after, as the R’s boss looked to inject some fresh legs and more pace into the QPR attack. The hard-working Luongo fired inches over the bar from 25 yards, while Aluko had a great chance to give Fulham the lead but shot wide from close range under the close attentions of Caulker. Meanwhile, Fulham substitute Neeskens Kebano should have done better with a far-post header in the 74th minute, but he guided the ball a foot wide from close range. In the 81st minute, Niko Hamalainen, who had come on for Lynch, stood a cross up to the far post which Button couldn’t hold, and as Shodipo burst onto the loose ball he tumbled in the box, but referee Lee Mason was quick to wave away any calls for a penalty. The R’s were certainly finishing the game strongly, and in the 83rd minute a Chery freekick to the far post found Onuoha in space but he could only direct his header over the bar. And in the 87th minute QPR grabbed a sensational goal to the delight of the R’s fans. Chery found space on the right and picked out Sylla at the far post, who flung himself at the ball and headed beyond Button. In injury time, Jozabed crashed an excellent free-kick off the bar for Fulham as Rangers worked hard to close the game out. But in the fifth minute of injury time Fulham were awarded their second penalty of the afternoon when Onuoha was harshly adjudged to have raised his foot too high in the box. 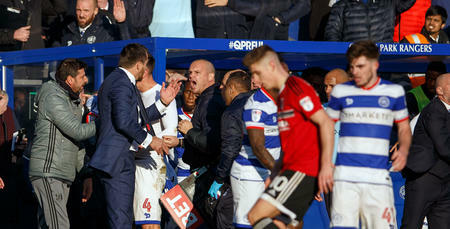 Aluko stepped up to take it but his spot-kick cannoned back of the upright, and seconds later the final whistle was blown to confirm QPR’s first win at the Cottage since 1980. 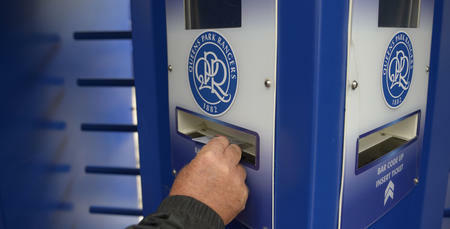 Extended highlights from QPR's trip to Craven Cottage.